From Aguas Calientes we took a bus on a short 20 minute ride up the mountain side covering approximately 20 switchbacks. 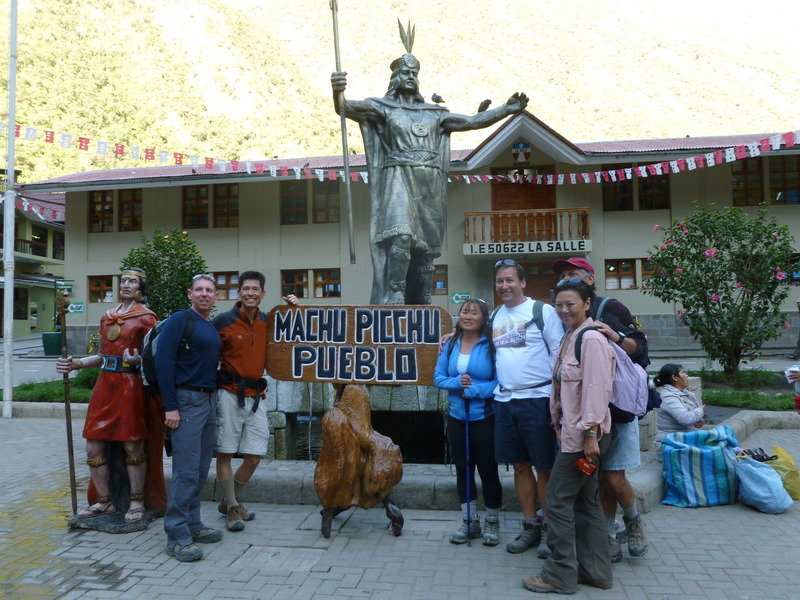 At the trail head are a number of plaques to commemorate the discovery of Machupicchu. 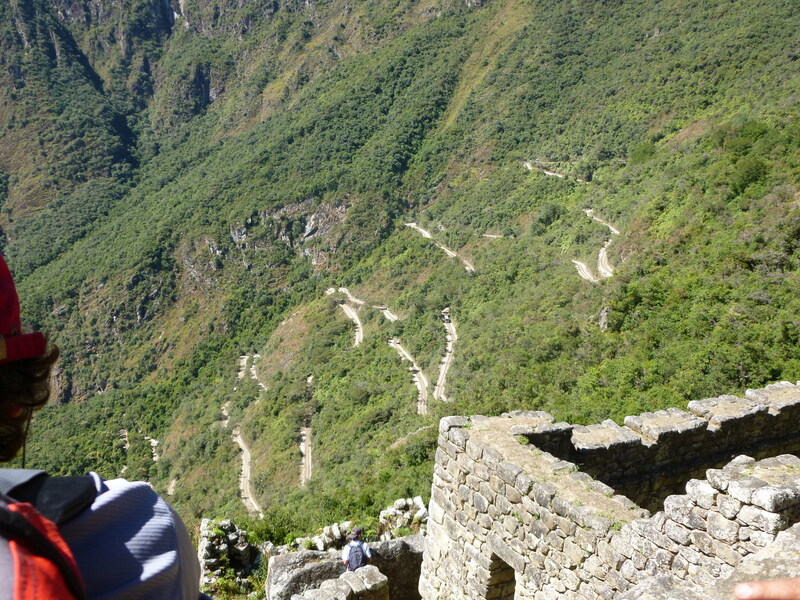 Hiram Bingham was a sociologist from Yale that had spent about 5 years in the area trying to better understand the paths of commerce between Argentina and the Andes region. He made a stop in a shelter at the bottom of the valley where he met a local boy. The child described to him the ruins where he and his cousin had cleared some of the area for them to play in. Later Bingham returned with a team of workers and other academics to start the discovery. It was only many years later that they truly understood the magnitude of their discovery. We asked our guide about the locals’ opinion of Bingham. Our expectation was that there might be resentment or other ill-will. 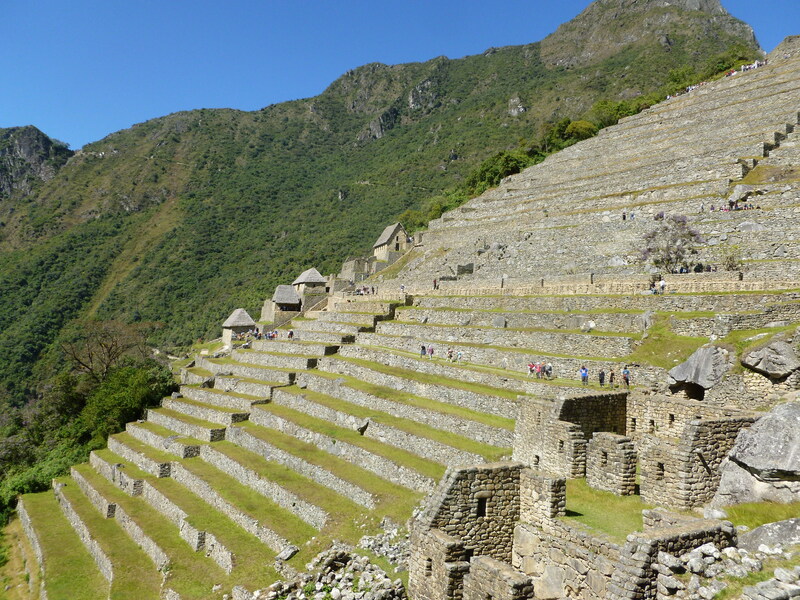 We were surprised that the vocals valued the tourism and opportunity to share their culture. 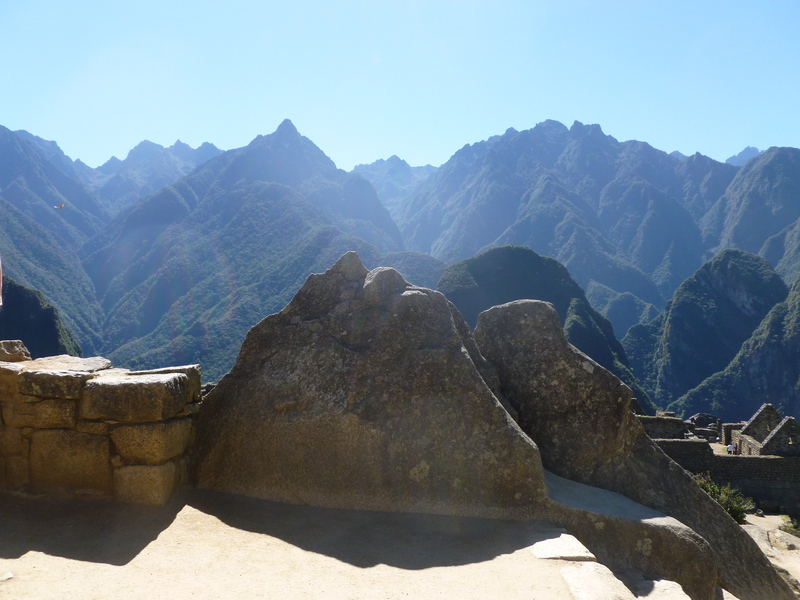 Rounding the corner, the initial view of Machupicchu was spectacular. 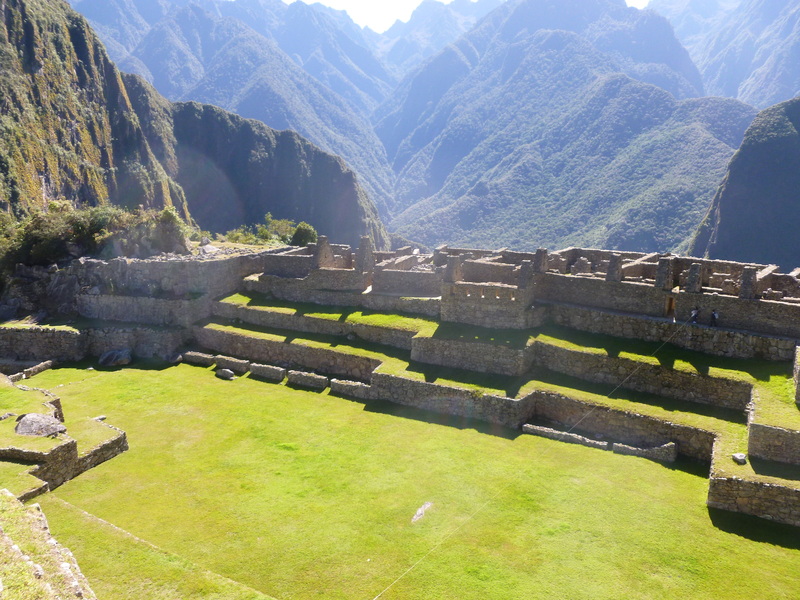 Machupiccu is unique because it appears to be a complete Incan city that is nearly completely intact. 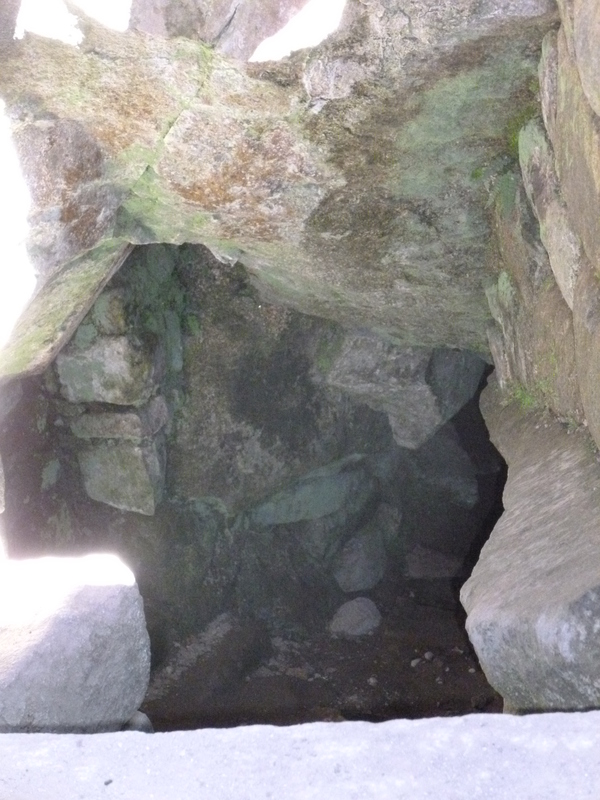 We encountered the temple that is a gateway to the underworld. 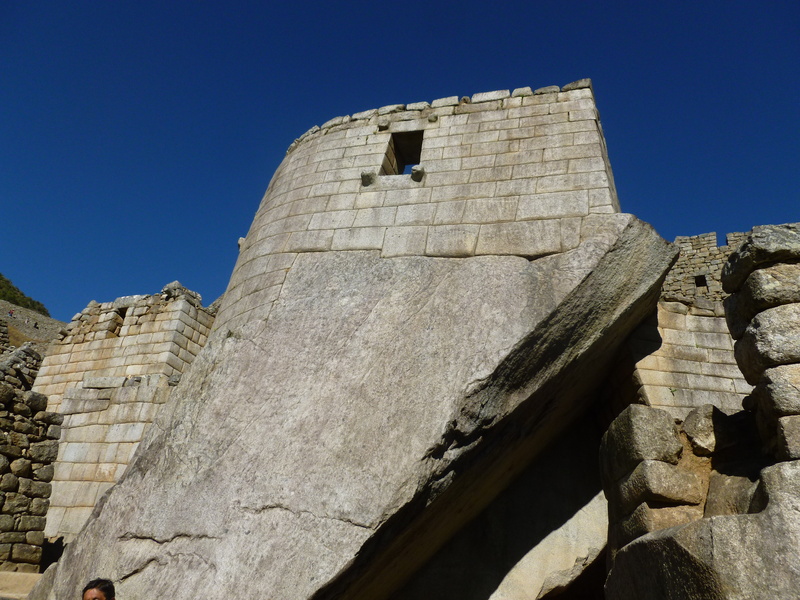 The ruins are well guarded by the rangers. 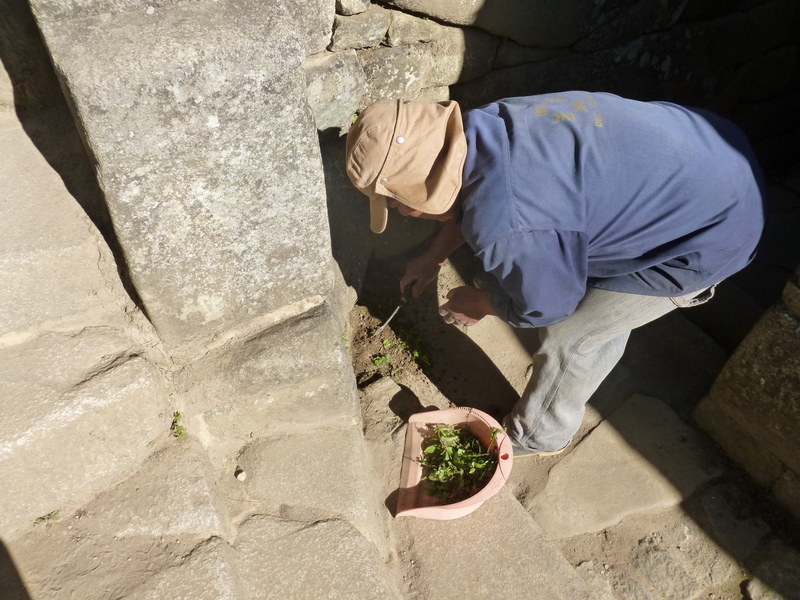 They are also busy maintaining the area. Around the corner is another temple. Here we see the complete manifestation of other observed ruins. 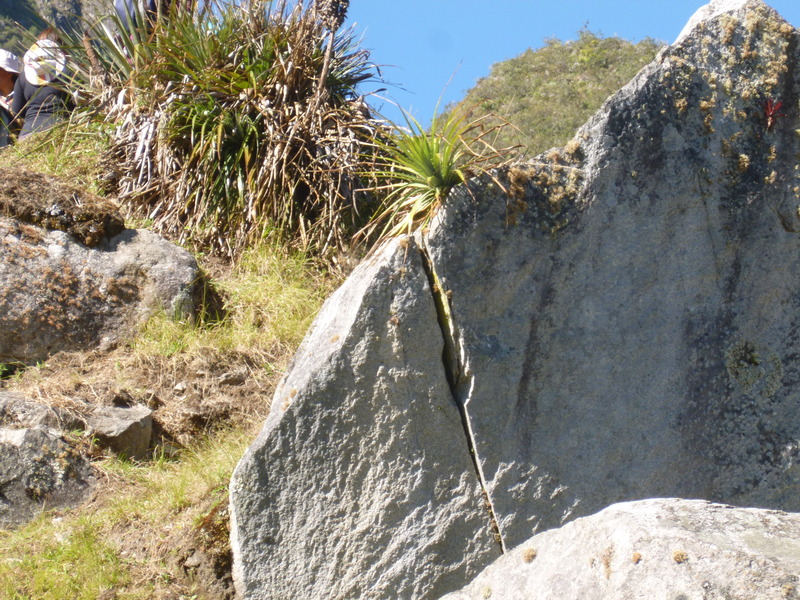 For example, the flat rock, with flat spots. 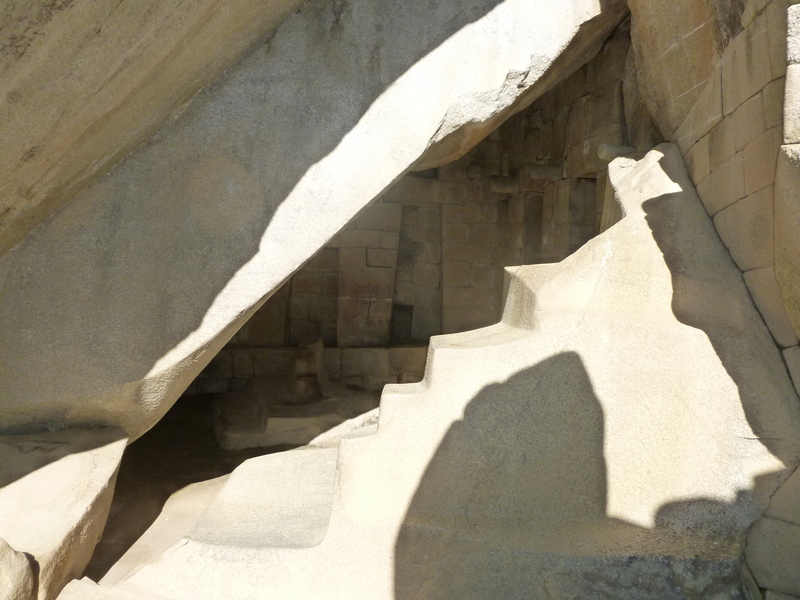 The sun shining through the window will line up with the flat portions during key moments such as the solstice. Around the next corner is the quarry. 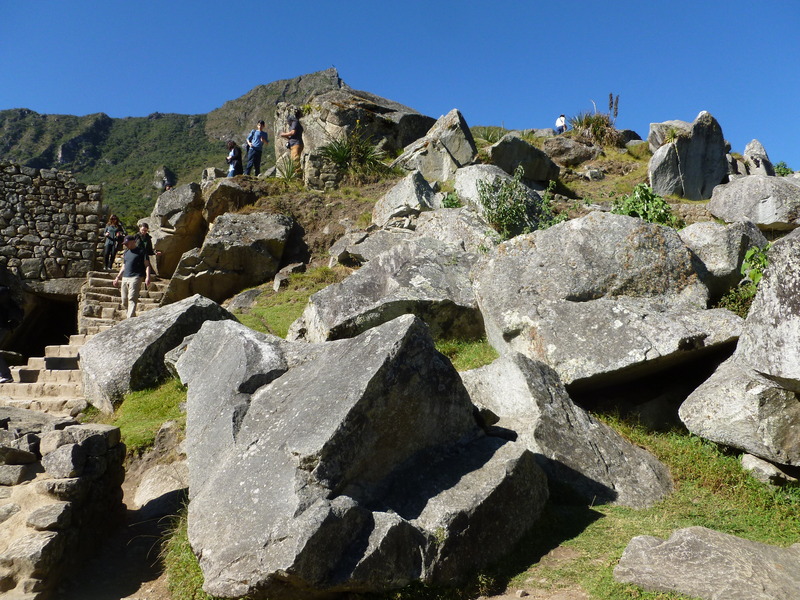 The largest rocks are left in place to keep the (relatively) smaller rocks from rolling too far down the hill. 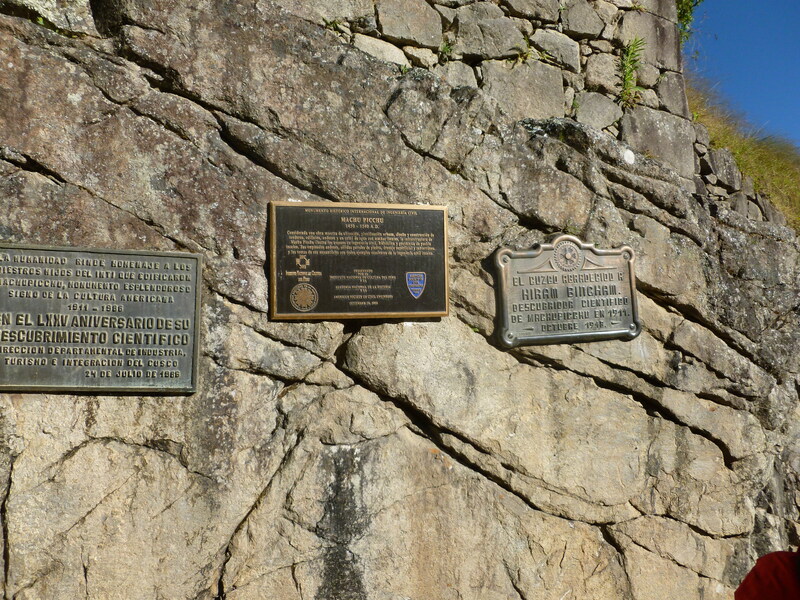 In the quarry is an example of a rock being split. The technique is to jam wood spikes into the crevice. Once they can not be wedged further they are soaked. The swelling of the wood causes the crevice to expand. 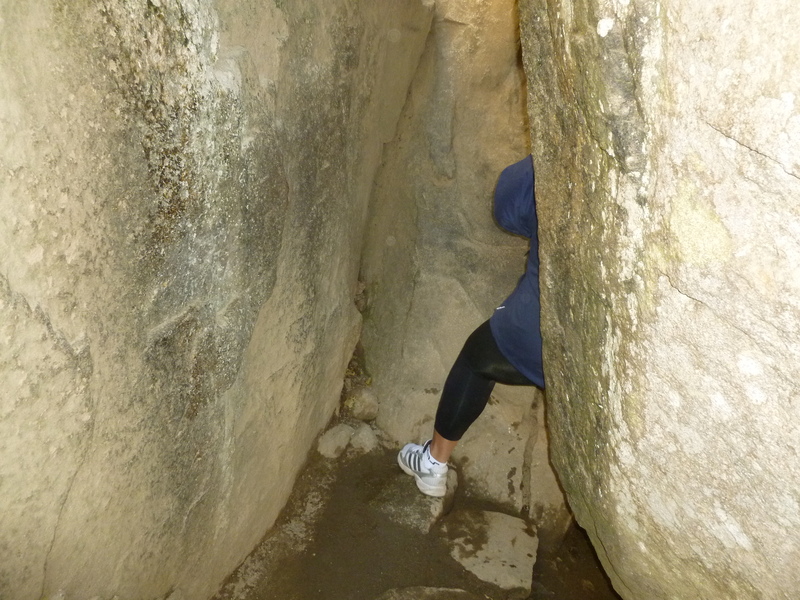 Then, small rocks are inserted into the crevice to maintain progress. This process is repeated again and again. It might take 3 months to split a rock this size. 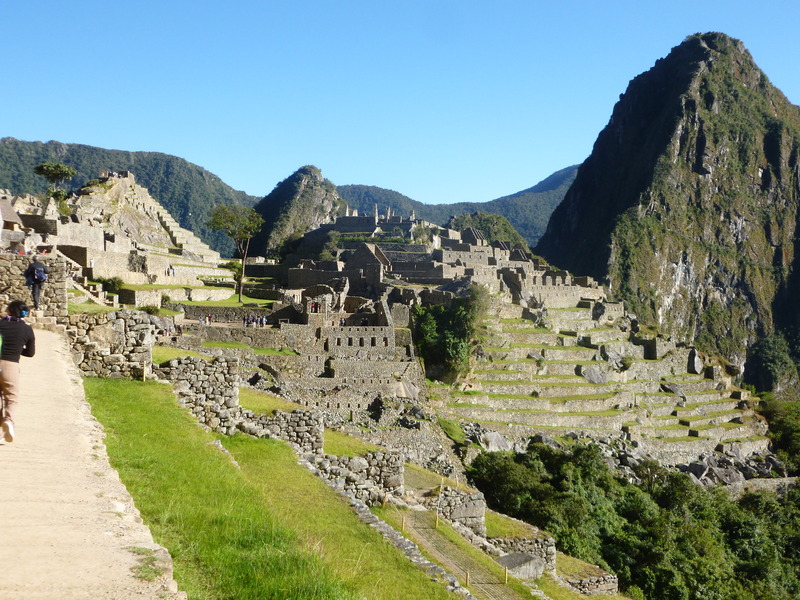 The Incan understood the idea of modelling. 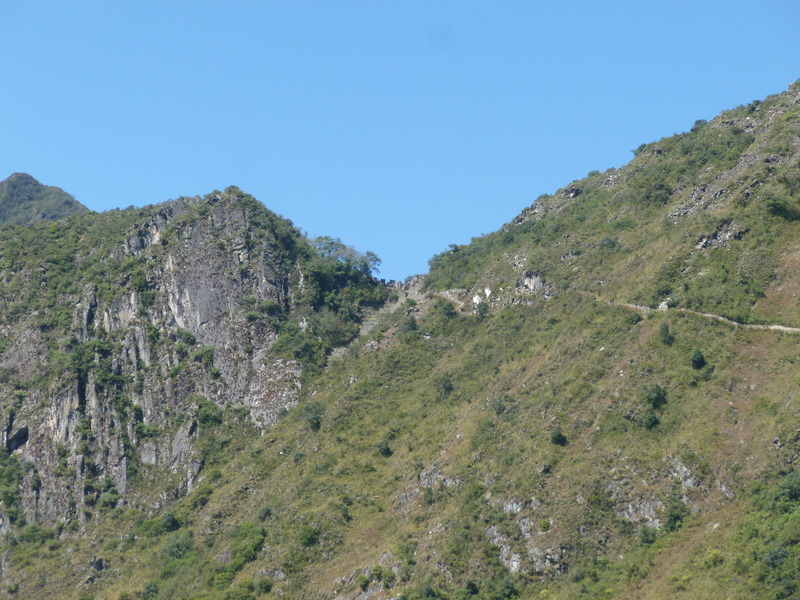 For example, this rock has the same profile as the mountains behind it. Behind the mountain model rock, is a vast open field. This was used for ceremonial dancing and other rituals. 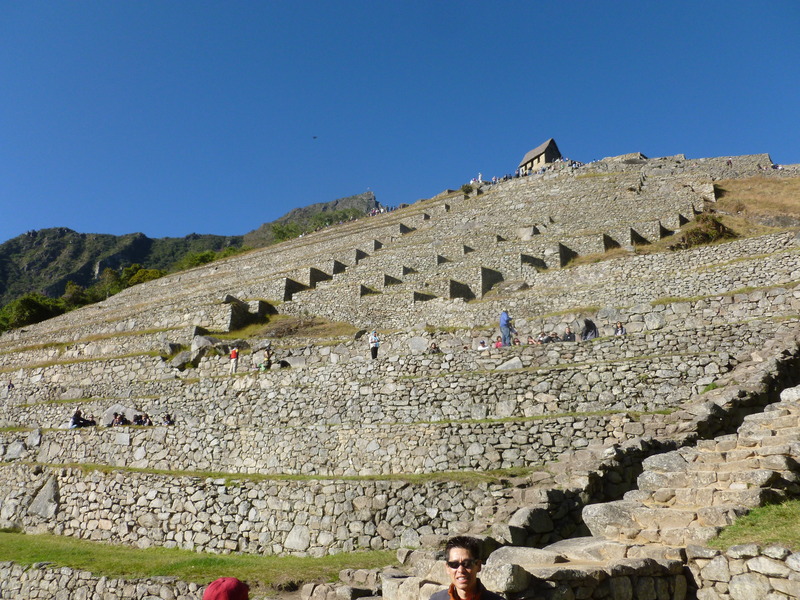 Machupicchu also includes a Temple del Sol. Some people believe this holds special power and is giving off energy that can be felt. 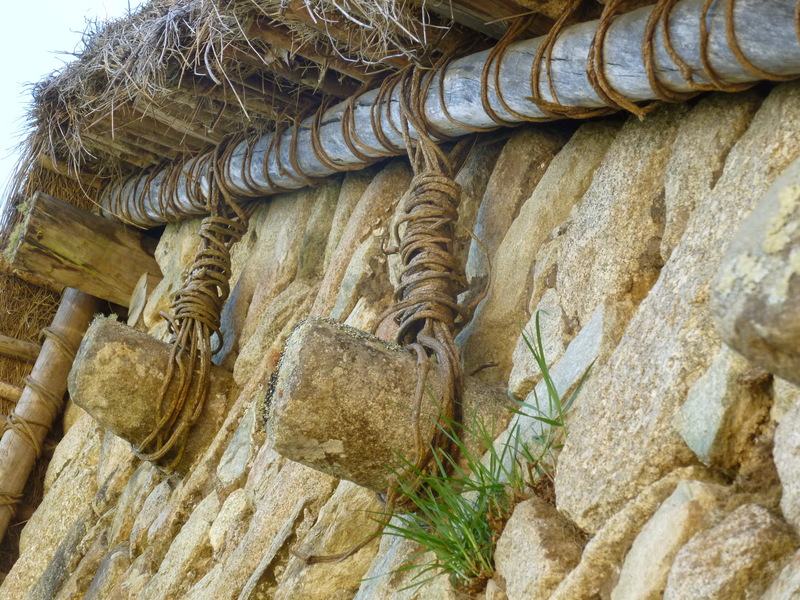 Some of the dwellings included complete roofs, including the lashing to the horizontal posts we had seen in previous ruins. 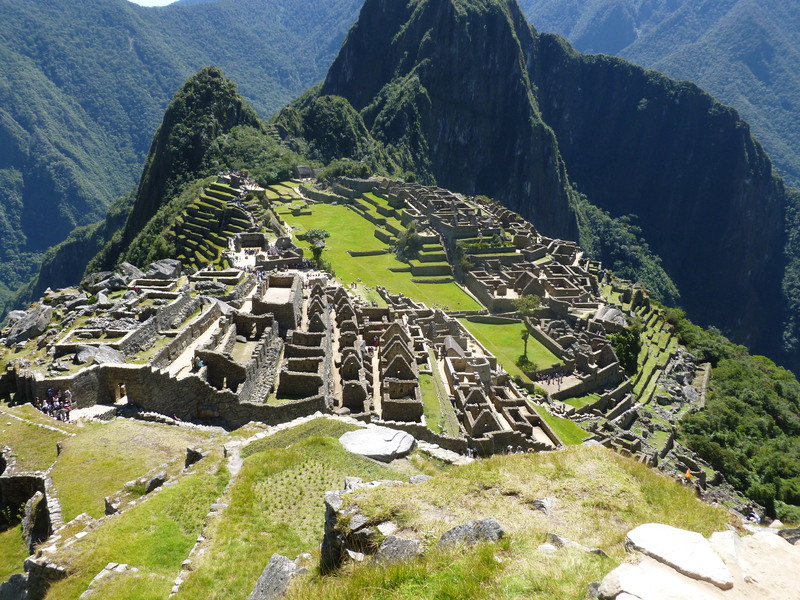 Machupicchu was discovered in 1911. 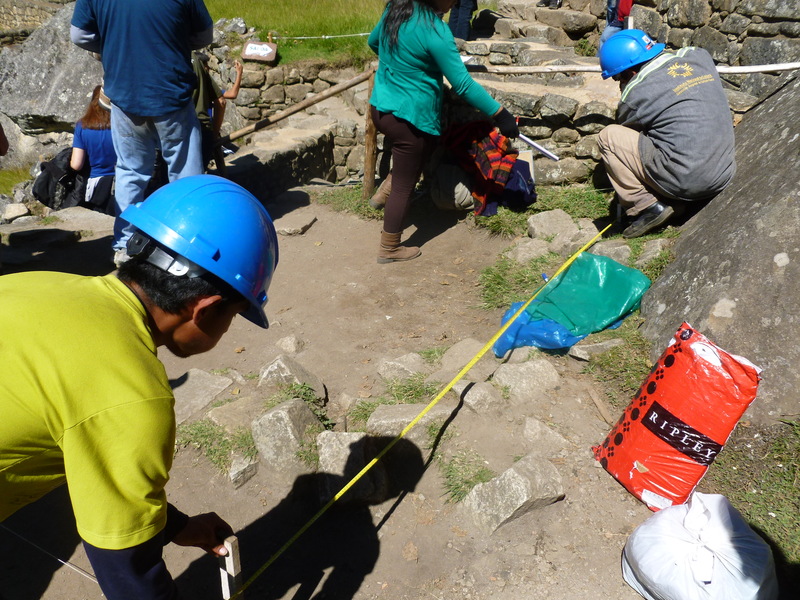 Surprisingly (to me) they are still discovering adjacent ruins. 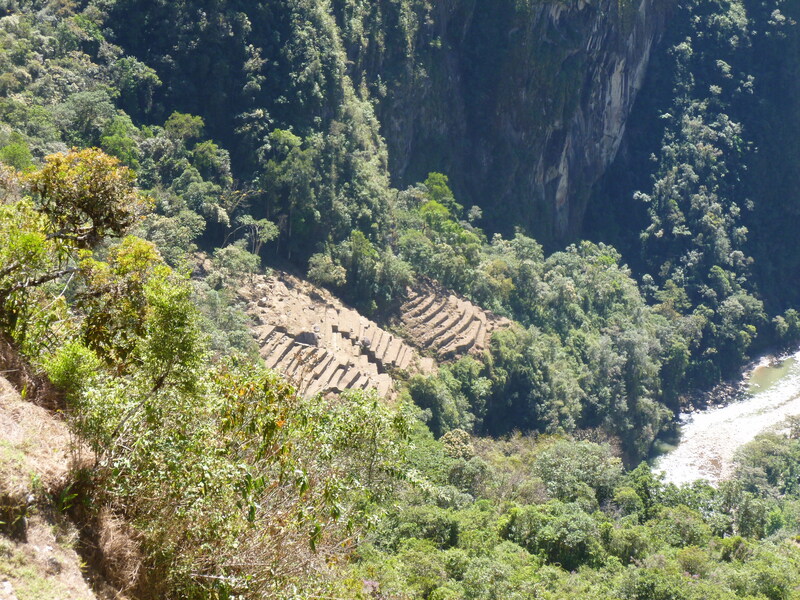 For example, these ruins are in the valley below Machupicchu and are currently being cleared. This work started in April 2012, so you can see the progress is understandably slow. 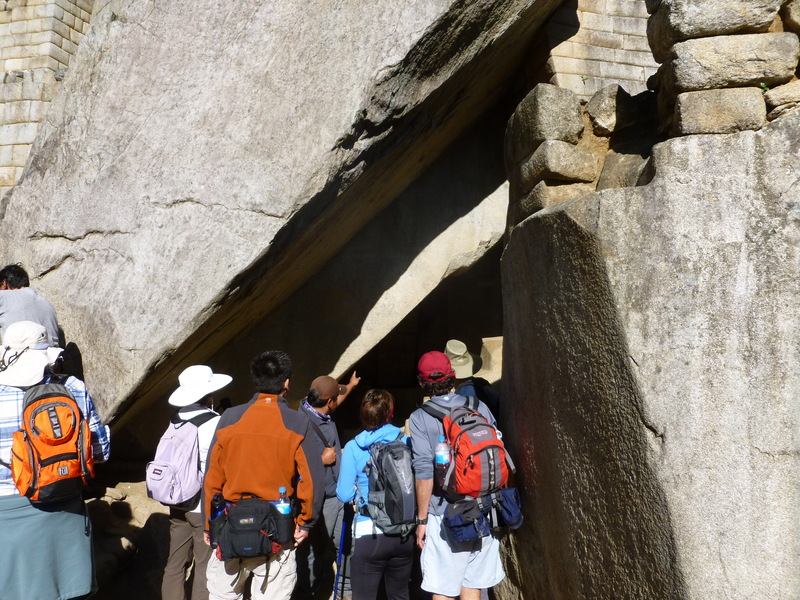 The next stop was the temple of the Condor. 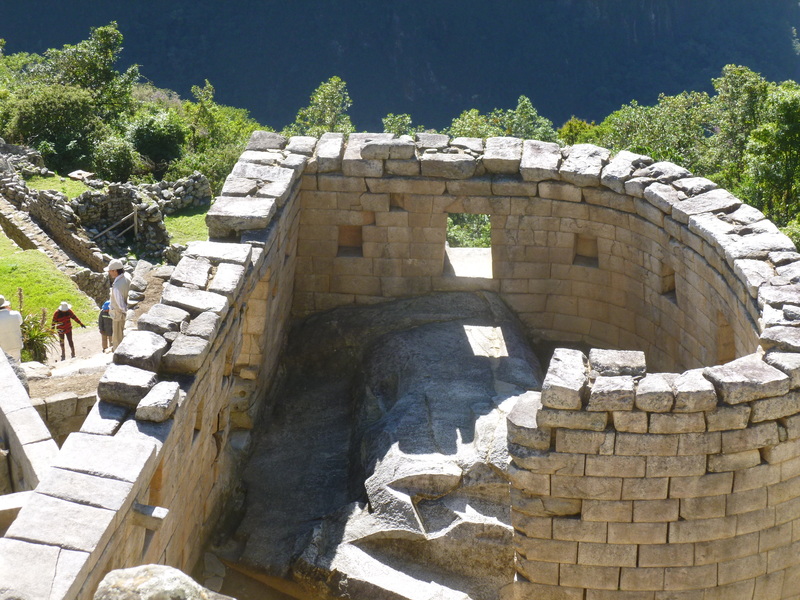 The Condor is the guardian to the afterlife. 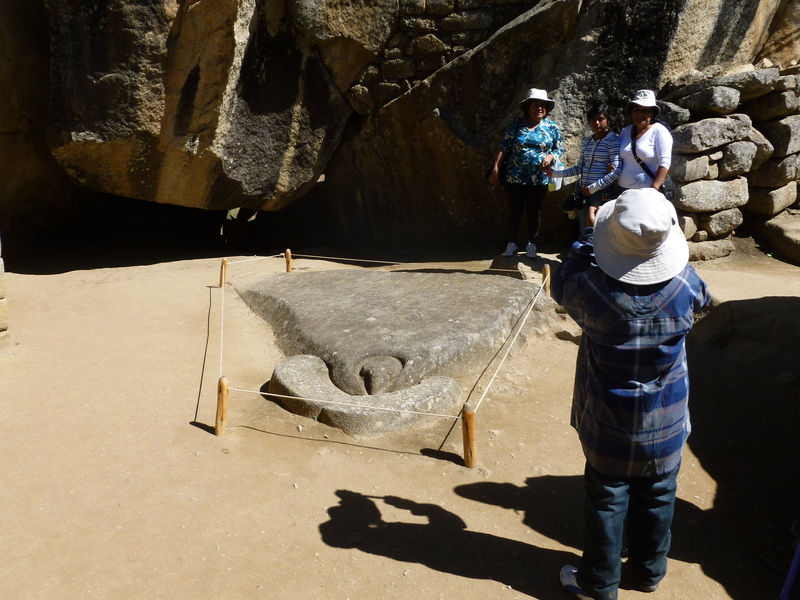 The rock in the ground represents the condor’s head, and the large rocks behind represent the wings. Behind the wings are the entrance to the afterlife. 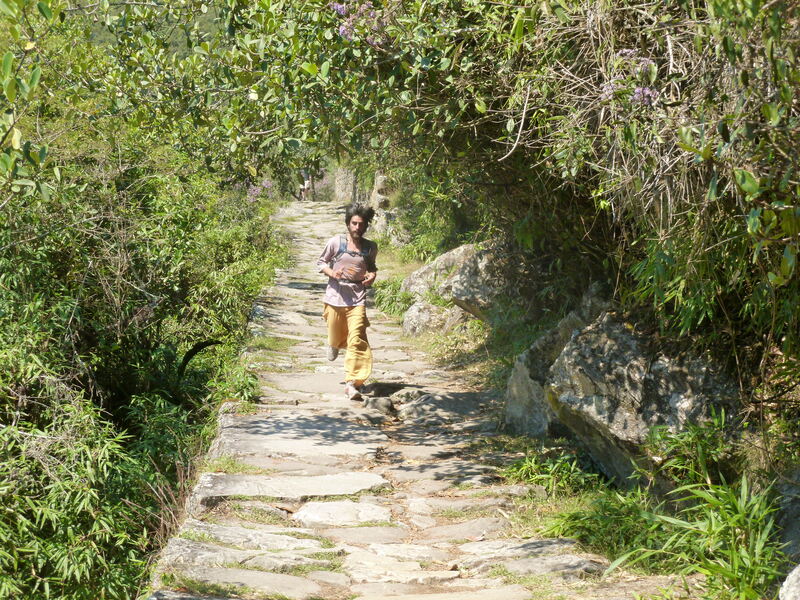 The path is very small and narrow, but it is possible to fit through. 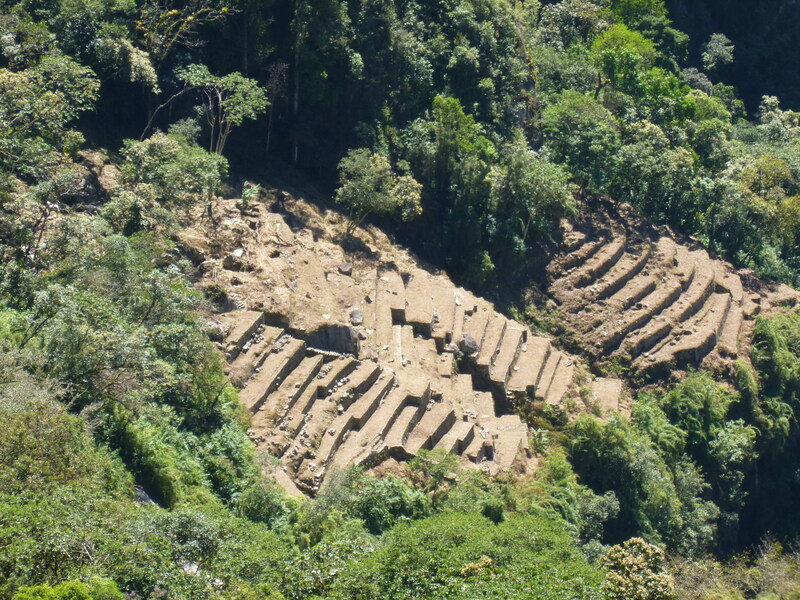 In addition to the different temples, there are also agriculture terraces and dwellings. 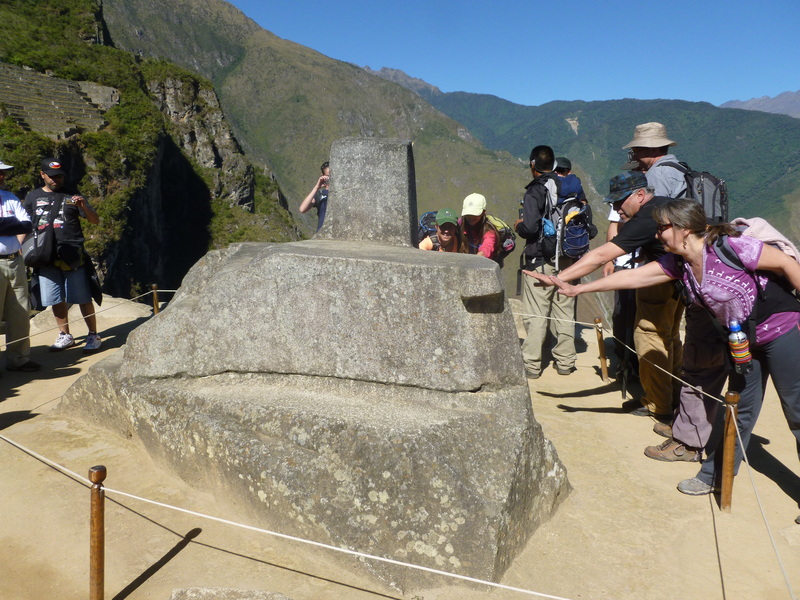 Cut into the top of the mountainside is the end of the Inka trail. 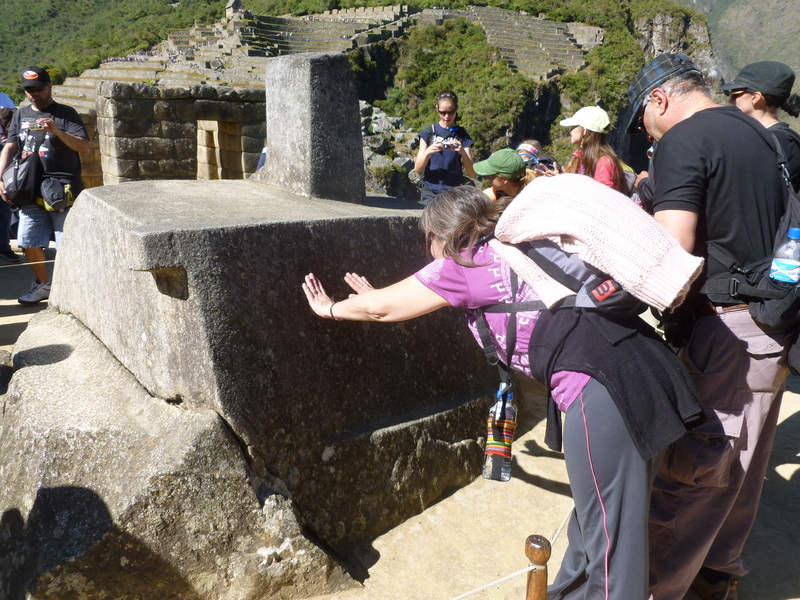 We decide to hike up the mountain to visit the original entrance to Machupicchu. Along the way we encountered several hikers and even a runner.